A few weeks after winning one of NASCAR’s biggest races, the Brickyard 400, 37-year-old Monster Energy NASCAR Cup Series driver Kasey Kahne got booted from one of the series’s best teams a year early. His teenage replacement in 2018 is William Byron, who’s only been in a real race car for four years—total. That’s because Byron spent his early years—which weren’t long ago—racing behind a computer screen. Byron was born in NASCAR central, Charlotte, North Carolina, but never got in a race car himself when he was a child. He’d been a fan of racing since that age, watching on television and not quite understanding what was going on. He told Jalopnik last year that it took going to a race at Martinsville Speedway, the shortest track on the NASCAR circuit, for things to really click with him. Vice reports that Byron got a racing simulator at 13 years old, setting it up at the desk in his bedroom and kicking off an iRacing career rather than running laps on a real, physical race track. But don’t let that put you on your “turning left is so easy” soapbox. Professional drivers use iRacing to practice. It’s not some kind of grown-up version of Mario Kart—iRacing goes out and scans real tracks, trying to make feedback for all of its cars and racing conditions as realistic and detailed as possible for those racing on the game. It isn’t easy. Byron also raced all the time, Vice reports. His father told Vice that Byron ran about 500 races over the course of a year and a half after he got the game setup, winning 104 of them. His parents told Vice they thought he was just spending time on video games. Byron’s father was a wealth-management adviser at the time, and his mom stayed home to take care of the kids. Byron told Jalopnik last year he didn’t think racing would be an option for him, since he didn’t come from a family that had roots in the sport. It didn’t take long for that to change. For a year, Byron’s parents paid for him to race. 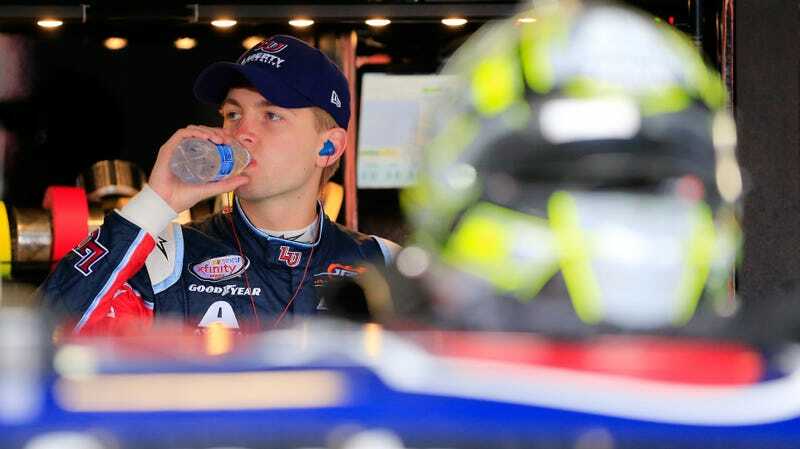 Byron picked up a sponsor in Liberty University after a meeting with the school’s chancellor, Jerry Falwell Jr.
Byron was full time in NASCAR’s lowest tier of its top-three national series by 18, and won seven of the 23 races in his rookie 2016 season. He probably should have won the title, but bad luck and NASCAR’s new championship format left him out of the final round of four drivers at Homestead-Miami Speedway. The new format calls for the highest finisher of the remaining four drivers in the final race of the season at Homestead to win the championship. Johnny Sauter finished third and got the title. Byron won the race. JR Motorsports, a feeder team for Hendrick Motorsports’ Cup Series team, picked up Byron to race in the middle-tier Xfinity Series for the 2017 season. He’s won three of the series’ 20 races so far, which is saying something since experienced Cup Series drivers are fond of dropping down into the Xfinity level and racking up race wins. Now, at 19 years old, the kid who can say he learned how to race on a computer as a teenager can say he’s a Cup Series racer at one of NASCAR’s top race teams, which currently has the likes of Dale Earnhardt Jr. and seven-time champion Jimmie Johnson in its lineup. He’ll race the No. 5 car next year. We’ve come a long way from the moonshine and “run what you brung” days in this technology-filled world, haven’t we?